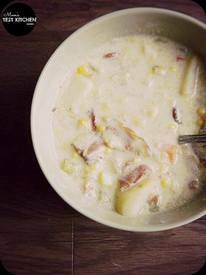 This chowder was super easy to make & absolutely delicious, plus it makes enough to feed us at least two dinners! It’s packed full of veggies & the broth is made with a canned soup so it’s really quick to get together! Throw everything into the pot about mid-morning, let it simmer all day & by dinner time you’ve got a hearty bowl of Bacon comfort just waiting for you! Serve it with a side of your favorite bread and you won’t be disappointed! Just full!! Oh, and if you ask me (or any other Bacon Addict for that matter), I add more Bacon!